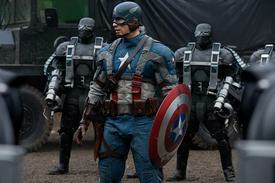 BoxOffice® — BY DESIGN: How Did 'Captain America' Make A Shield Out Of A Made-up Metal? How do you make a shield out of a metal that doesn't exist? Vibranium is the strongest, lightest, rarest material in the world. We set up a facility in London where we had up to 42 guys making props for the movie. A fiberglass facility, a small machine shop, a spray shop. There were three guys working on the shields pretty much full time. We had to find a product that was as like vibranium as possible. We looked into fiberglass, but decided on aluminum and then we had to make it look as cool as possible. In the 2D comic world, it was just a regular domed shape. To make it look more aggressive on screen in 3D, we gave it a machine finish. The science of the shield was quite intense. We were concerned about the size of the shield because we had to make Chris look as big as possible. If we made the shield too small, it would look ridiculous because it wouldn't be able to protect him. We also for the stunts made smaller shields so they'd be less obtrusive. They took on the development from it being the old shield, the classic Knights of the Templar shield used in the USO show, onto the research development and production of the circle shield, which went through several guises. Warfare was so different back then. It was really fun to get into the idea of him fighting the world in a pure and iconic way. The biggest challenge in any film is to not overcomplicate the props, to make it as simple as possible. And durable, it can't fail on set—you have one attempt to make it work that first time. We had to make five different types of shields. We had shields of aluminum, then we had lightweight shields which were aluminum-faced but with a fiberglass back. We had hard and soft rubber shields which we used for throwing and hitting and other stunt requirements. We did early tests to see if they could fly—used them almost as frisbees—and tried to see if we could have control of them. No. They would have taken out most of the camera crew. In the very early days, we realized we could not be throwing the shields. Although we had some pretty cool ideas of what we could do with rigs if we could throw them. We had rims attached so Chris could catch them quicker and open handles on the backs so he could fling it around. But it was decided at the end that for safety, we would not be throwing them. I think most shields were around 9 pounds. We were asked to get them down to 3 ½, 4 pounds so they didn't pull down on Chris' costume. The aluminum weighed about a pounds and a half, two pounds, but then there was the leatherwork. We also had some incredibly lightweight versions made of foam with steel rims so that they could be magnetized onto Chris' back for when he was running and when they had to clip on and pull off his back. And then there were the seven stages of scuffing for the shield because it gets more worn as the movie goes on. One of the Marvel illustrators started to sketch how we would show the damage and the director, Joe Johnston, was in on the act. He would mark how much degradation we had put on to it. We used to keep seven sets of shields including the clean version you see in the trailer where the shield is picked up as just raw, unpolished aluminum in Howard Stark's lab. Then we went from the clean version, Stage Zero, and went from there to Stage Six. Stage One was painted and unused. Stage Two, you see in the montage sequence with the Invaders, and then it progressed from there. The last time we saw the shield it was in the ice at the end after the fight with Red Skull, and later on there's a scene where we did the shield in later times, but I don't think that's in the movie so I won't say anything. Marvel always likes to have mementos from other movies. Iron Man 2 came out while we were in pre-production and we were sent quite early on the Iron Man shield. We thought maybe it would be one of the prototypes the first shield would be based on, but Joe and the producers wanted to have it slipped in to have a link between Iron Man and Captain America. We created two versions—painted and one without paint—and slipped it under Stark's workbench along with five other shields. But the whole thing was that Captain America wanted something pure, so he walked past the gimmicky, gadgety shields and went straight to the simple one. I'm doing a film at the moment set in medieval times, Snow White and the Huntsman with Kristen Stewart, and using shields throughout, but I haven't had any of the problems we had in Captain America. But with Snow White, there are props where you have to think of how they were made in 1315 and then you try to produce that today. Today, I sound like a shield expert, but I’ve done a Bond film, I’ve done period drama. And now I'm learning something new again. Quite a few people ask if I know everything about history. The answer is no, but you cram up. It's like going to an exam. I've got boxes and boxes of research materials. One day you could be doing something about World War II, then medieval China or Japan. Or something futuristic. Or like The Golden Compass, a completely different world—a world not unlike ours, but one with an art deco society. You don't have to know everything. You just have to know how to adapt. I'd tell people interested in prop-making to watch, listen and learn. I started 30 years ago and I’ve been a propmaster since 1987 or 1988—about 22 years now. I was offered a job which was going to be for two weeks and I’ve been doing ever since. It's a strange way of life. Every day you do something completely different—there's no repetitiveness to the job. I think if you come in as a teenager, it's probably wrong. I think you need to come into this industry with a bit of a modest life. Come in with a little bit of knowledge. Never profess that you know everything. You feed off these directors, designers, decorators who all want to do the best they can at a movie. One of my early films was Legend, the Ridley Scott/Tom Cruise movie. That was the first time I started to work as a prop maker and it was very, very simple. Now it's gotten so technologically advanced it's beyond me. Every day, I learn something new. We've all seen so much evolution in the industry that I hope prop-making can carry on, that it's not a dying art. That computers won't take over every corner. I worked on Inception, but I didn’t design the top. We did about 30 minutes of film in the UK and Europe and Morocco, that I had to do. A bigger challenge was The Golden Compass, the alethiometer, a compass that can answer any question. We again had to make something that didn't exist. We cast a bronze casing and then strung in components of a machine that worked so we could have a remote-controlled alethiometer. Or again like in Captain America, the cosmic cube that Hugo Weaving's Red Skull controls. What we had to do was make such a bright power light source you couldn't tell what it was—something which had the intensity and brightness of the light it had in the film, but you could never tell if it was square or a moving form. We went through incarnations of the cube. It started off being a clear cube which was amorphous. We were going to put nano-reflective particles into it so that if any light was being refracted, it would change colors. In the end, it was a very simple item that was taken over by visual effects. And after all that, I haven't even seen the final movie yet—I'm excited to see what it will look like on film.